Talking of model rail, here's an auction for a gorgeous item of retro railiana that's going on right now. 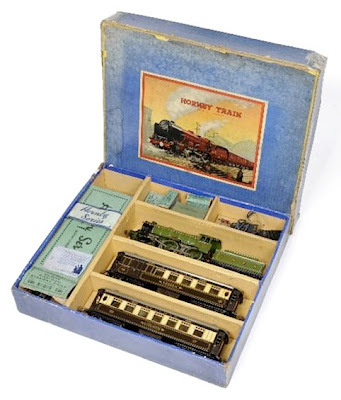 It's with Tennants the live auction site, and this Hornby set consists of a O-Gauge Electric E220 loco, the Bramham Moor Special Pullman LNER train Set TS2415. The 20 volt set contains the 4-4-0 locomotive and tender in green and black, two brown and cream Pullman coaches Verona and Loraine, plus track and accessories in a sturdy blue card box. Also included are extra boxed rolling stock and accessories, including a breakdown van and crane, a meat van, plus a trio of wagons - side tipping, gas cylinder and fibre. There's more in three extra boxes, including a signal cabin, level crossing, footbridge, junction signal and various lengths of track - there's even a platelayers' hut to add a bit of interest to the trackside. The whole thing's just terrific for any classic rail lover, and with a guide price of £700-10o0 GBP ($1100-1600 USD), in SMN's opinion it's worth every penny.